Frog terrarium kits are great for beginners and experts alike. They’re great because they combine many of the products you’ll need to set up a frog or toad enclosure while saving you some money in the process. Unfortunately, there aren’t many kits available. In all my research, I only found 4 kits made specifically for frogs. Three out of the four are meant for tree frogs and two of the four are really hard to find online! One thing to remember is this; do your research first. Know how to care for the type of frog you’re getting. Learn how to set up their enclosures by reading care sheets. Once you have this information, it’s easier to decide whether or not buying a starter kit is right for you! As you can imagine, buying a terrarium kit not only makes things easier, it also saves you a nice chunk of money too. By purchasing a kit, you’re allowing a company to bundle several of their products into one purchase. You save money and they make money; it’s a win-win. On the other side, however, buying a kit for frogs has its drawbacks. For starters, there aren’t many kits available; most of which are made for tree frogs. Sure, that’s great if you want a tree frog; if not, you’re not left with many options. Also, you’re limited to decorating the cage with what’s included in the kit, unless you want to buy more things. Speaking of which, you still need to buy more stuff. None of these kits have every item you’ll need to care for your pet frog. I searched the internet so you don’t have to; finding all the terrarium starter kits for frogs. You can see the kits available in the sections below and I’ve taken the liberty of listing everything they include. This kit is good for tree frogs. It’s a vertical terrarium with more vertical space than horizontal space, which is great for arboreal species. It’s an all-around great starter kit for someone who wants a tree frog. It has two options on size; medium and small. Both kits are the same, aside from the size of the terrarium. The medium kit is 18″ x 18″ x 24″, which is great for housing 3 or 4 tree frogs. The small kit is 12″ x 12″ x 18″ which is good for 1, maybe 2 frogs at most. 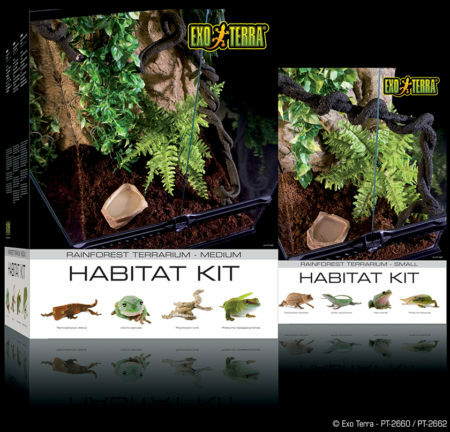 The Exo Terra Habitat Kit is perhaps the most robust starter kit available. It comes with the terrarium, a “compact top” which I believe is the hood light, a small water dish, decorative background, plantation soil (coconut husk fiber) substrate, three different plant decorations, a vine, a hygrometer, thermometer, and last but not least, an instruction manual. After all my research, I’m not entirely sure that the light bulb is actually included with the hood. It may or may not be. Exo Terra has 3 common bulbs in their “Repti Glo” series. They’re 2.0, 5.0 and 10.0 UVB bulbs. The number represents a percentage of UVB light the bulb emits. 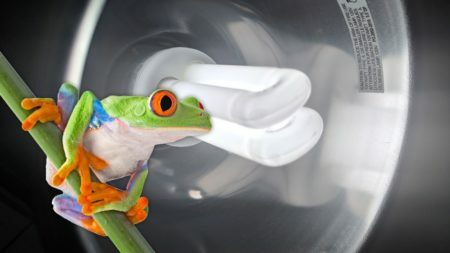 Should you be presented with an option to pick a bulb, 2.0 UVB is best for most amphibians. Here are some things you still need; a water conditioning agent like ReptiSafe, optional branches, a spray bottle for misting the enclosure, possibly a drainage layer which includes a substrate barrier and hydroballs, and a heating element. The heater is only a requirement if the room temperature of your house is too cold. Some frog species require warmer temperatures while others do quite well in the low 70’s. Yet another kit suitable for tree frogs. This one, however, is from the folks at Zoo Med. 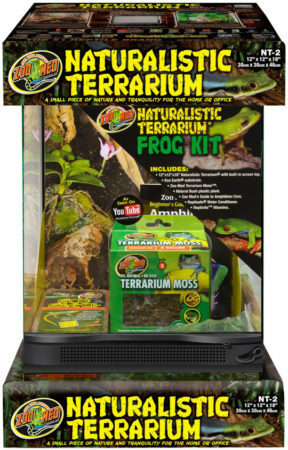 Their naturalistic terrarium frog kit includes a terrarium, eco earth substrate, terrarium moss, one fake plant decoration, ReptiSafe water conditioner, ReptiVite with D3 (a supplement), and an amphibian care guide. Unfortunately, I cannot find anywhere to buy this kit online. Check your local pet store! I like the price of this kit. It’s great that it includes terrarium moss, which helps to retain moisture in the substrate and throughout the enclosure. I’m fairly certain the moss is sphagnum moss, something you will mix in with the substrate. There isn’t much in the way of decorations and, unfortunately, there is only one option for size; 12″ x 12″ x 18″. 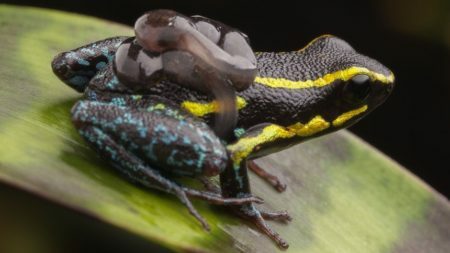 Personally, I wouldn’t put two frogs in an enclosure this small but it’s definitely enough room for one. Here is what you still need to buy; a water dish, heater, possibly a drainage layer with a substrate barrier and hydroballs, optional branches, a hygrometer thermometer, spray bottle for misting, and a light. Not all of these items are needed; it depends on the species of frog you’re keeping. 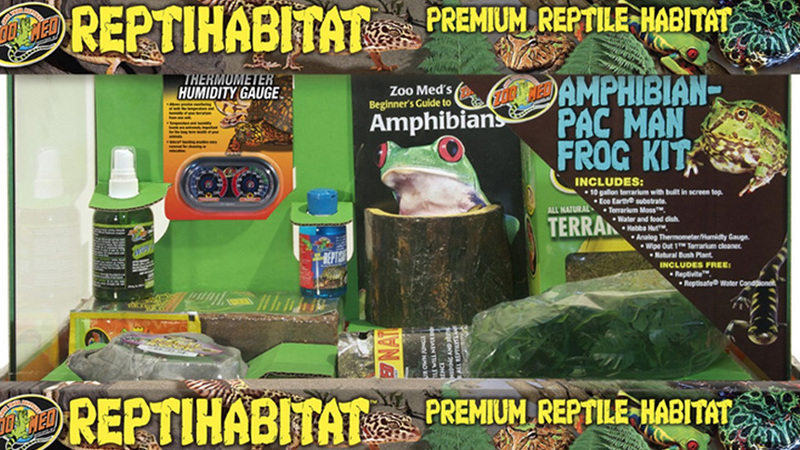 The Zoo Med ReptiHabitat Amphibian Kit includes a 10-gallon tank, ReptiSafe water conditioner, eco earth substrate, terrarium moss, a log hut, food and water dish combo, a plastic bush plant, analog thermometer hygrometer, ReptiVite, a terrarium cleaner, and an amphibian care book. This is yet another one I cannot find available online. Your local pet store might have one in stock or perhaps they can order one for you! In my opinion, Zoo Med did a great job with this kit. It covers almost everything you’ll need. That is, everything you’ll need for a terrestrial frog or toad. This starter kit is great for Pacman frogs, toads, Tomato frogs, and other terrestrial species that don’t require much vertical space. The only real downside is the size of the terrarium. 10-gallons is enough for a single toad but, if you want more than one, you’re going to need a larger enclosure. Also, depending on the species you’re keeping, you may need to get a few more items. Here is what you might need; heater, lighting, drainage layer with a substrate barrier, and a spray bottle for misting. Both the heater and lighting is dependant on the species you’re keeping. For American toads, they don’t require UVB lighting and they do well at room temperature. However, if they’re in a room that gets very little or no light from windows, then they should be provided a light for their enclosure. 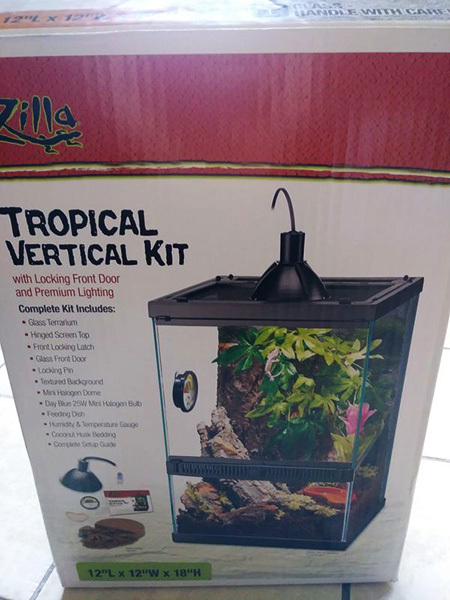 The Tropical Vertical Kit by Zilla is similar to Zoo Med’s Frog Kit. This starter kit includes a 12″ x 12″ x 18″ terrarium, textured background, mini halogen dome with bulb, food dish, coconut husk fiber substrate, hygrometer thermometer, and a setup guide. I like that it comes with a halogen dome and light bulb. 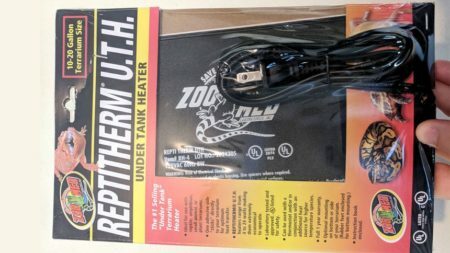 This can be used to warm the enclosure, which is great for frogs that require higher temperatures. On their website, they were very careful to mention the halogen bulb is not a UVB light. So if your frog needs UVB, you’ll still need to get one. Zilla’s Tropical Vertical Kit is great for tree frogs. Things you still need; branches, plants, drainage layer with a substrate barrier, spray bottle for misting, and a water conditioner for amphibians. The branches and plants, whether real or fake, are a must for tree frogs and this kit, as far as I can tell, doesn’t come with any of that. The halogen bulb can be used as a heating element, the food dish can be used as a water dish because crickets won’t stay in the bowl anyway, and a drainage layer is only needed for humid terrariums where a lot of water is used. 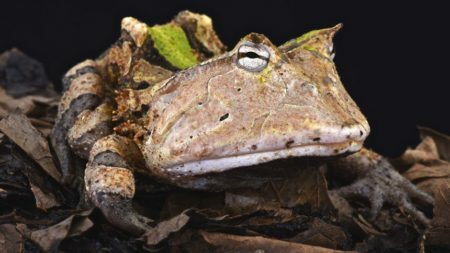 Amphibians are popular pet but they’re not quite as popular as reptiles. 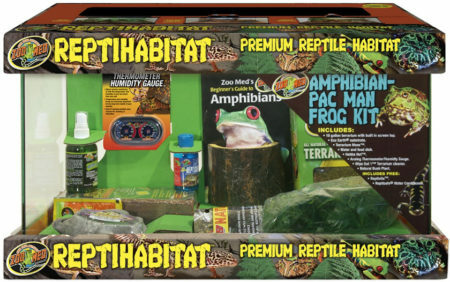 As such, there are more terrarium kits for reptiles than there are for frogs. Some of these kits might work, but it’s important to know what to avoid before investing in one. 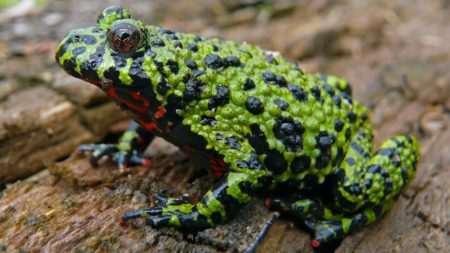 It comes down to knowledge about the type of frog you’re keeping. Learn what they need and how to set up their cage first! That bearded dragon starter kit might look cool but a Pacman frog needs a substrate it can burrow in, not a plastic reptile carpet. You get the point; avoid kits that don’t contain the things your frog needs. This next tidbit of information is for those of you who plan to order online. Pay attention to the size of the terrarium! Only one of the kits offers multiple sizes. 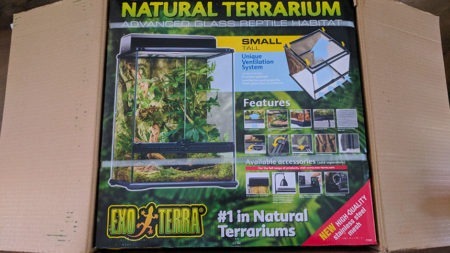 If you want to keep 3 or 4 frogs in the same terrarium, the Exo Terra Rainforest Habitat Kit is the only one that offers a terrarium big enough. For what its worth, I think its the best starter kit for arboreal frogs; I highly recommend it.